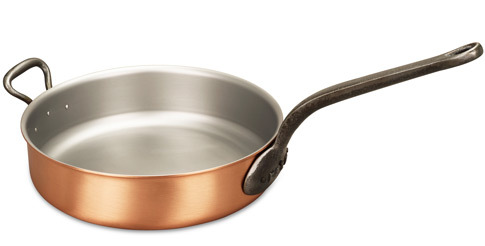 We know you'll love this	28cm copper saute pan with helper handle	as much as we do. Worth every pound! A monster of a vessel, this sauté pan allows you to fit in more ingredients in a single layer, saving you time by reducing the number of batches when browning food. What I used to have to cook in 3 or 4 batches can now be done in 1 or 2. There are no hotspots. Food browns beautifully and the pan is extremely responsive to heat changes. The pan is very easy to clean after a soak. The pan's long handle is conveniently slanted. This means that despite the pan's large size, I am still able to place it in our domestic oven. Just put it in diagonally. The pan is as heavy as it looks even without food. Therefore the helper handle is a welcome addition as the pan's weight can be difficult to support solely with the long handle. A sauté pan is a must have in my kitchen! best pan I've ever had This pan, as you might expect from Falk and for the price, is exceptional. Basically, you get what you pay for. Top stuff. excellent, but doubts about handle shape Only used a couple of times thus far. One negative point, losing a star; I feel the (main) handle comes up rather high and at a funny angle. Maybe it just needs getting used to. Price is OK for 2.5mm copper, albeit not cheap by any means. Service and delivery was exemplary. Fantastic Buy How amazing,a fantastic size sauté pan for cooking with high heat. No hot spots perfect size for cooking for 3 or more. I have been cooking professionally for over 30 yrs using Bourget as well as Mauviel. There main down fall is there up keep. Falk has come up with a perfect solution using there brushed copper, Now you can spend more time cooking than cleaning. With there invention of bimetal technology with stainless steal cleaning is made easier as well as no fear of retinning in the future. HUGE pan, but HEAVY!!! Huge flat base, ideal for sauteing large amounts of food. Heat distribution is excellent just as you would expect from copper, and easy to clean too when you are done. My only reservation about this has to be the weight. It is really, really heavy and would definitely not suit a petit female chef! Cooking big! I love the size and sturdiness of these pan. Its big surface and higher sides makes for a less messy affair when sauteing or frying. 839 customers found this review helpful. Did you? Yes, I did! You know you want it Having previously owned copper sauce pans, this was my first experience with sautéing with copper. I had heard that copper allows for great high heat cooking. My first use involved pan frying steak, which had a lite olive oil marinade. Unfortunately the pan had gotten a lot hotter than i expected and the oil spattered and burnt on to the interior surface, requiring a great deal of effort to clean. Since then i have given this pan a lot more respect with regards to how i use it and what i cook in it, and i have been rewarded with consistently reliable performance. It's very heavy when loaded with food, but the size makes it a very versatile item. 825 customers found this review helpful. Did you? Yes, I did! 776 customers found this review helpful. Did you? Yes, I did! 761 customers found this review helpful. Did you? Yes, I did! Too heavy to steal!!! We have a lot of people over this summer and we do a lot of cooking. We split the preparation of the dishes between the guests and everyone is eager to try the pans we received yesterday. My daughter Karin prpared the different vegetables in this beatiful pan. She wanted to take it home. Fortunately it is too heavy for het suitcase. 681 customers found this review helpful. Did you? Yes, I did! Great product I bought this sauté pan as a Christmas present for my husband. He is a keen cook and very particular about his cookware, but this has definitely met his standards and he loves using it. He wanted this particular pan as it will not need re-tinning unlike some other brands, and because the copper conducts the heat so well you don't need to turn your hob up so high, so it's great for simmering things for a long time as it uses less energy. It's very solidly made and a good weight (i.e. heavy!). He has only had it six months but I'm sure it will last for many years. A brilliant present for someone who is really into their cooking. I'm sure I will be buying more Falk products for other birthday and Christmas presents! 659 customers found this review helpful. Did you? Yes, I did! 655 customers found this review helpful. Did you? Yes, I did! A real workhorse This pan is a real workhorse, that can handle so many different cooking applications. The large surface area, capacity and solidity make it the pan I am likely to reach for most often. 644 customers found this review helpful. Did you? Yes, I did!